A map of a proposed subdivision project that is submitted to a local planning agency for study and conditional approval. A Parcel Map is an official map that shows a subdivision of land into four or fewer parcels, sometimes with a “designated remainder.” This map depicts property lines, easements, and monuments set by the Professional Land Surveyor in accordance with the Subdivision Map Act and local ordinance. The map is created to show the locations of each parcel and its relation to surrounding surveys. A Parcel Map is recorded within the county in which the survey is performed, following acceptance by all agencies and governing bodies. Record of Survey is a map that shows the location of deed described boundary or easement lines, based on field measurements. Sometimes only a portion of the entire site is shown. This map is reviewed by the County Surveyor for the elements required by the Land Surveyors Act, and then filed within the county in which the survey was performed. A Record of Survey represents the opinion of the Professional Land Surveyor as to the location of those described lines and retracement findings. The Record of Survey also shows sufficient information to locate the survey on the ground, and documents potential title issues related to the specific property lines shown and affected neighboring parcels. 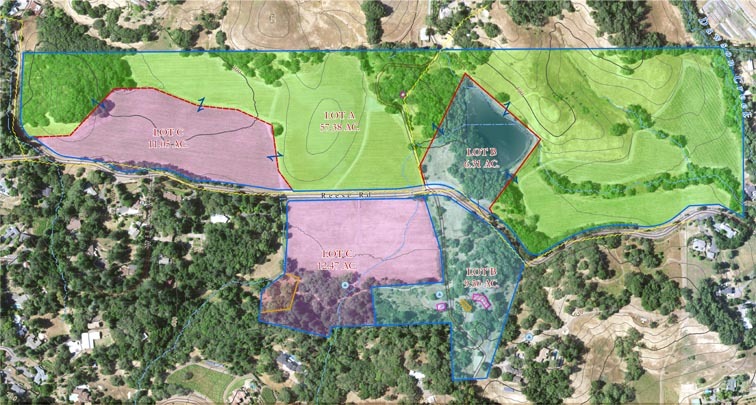 The above two maps were used in court to prove that the owner had planted a vineyard over an equestrian easement. The one on the left was marked on a quad sheet to represent an existing road. The one on the right is a current aerial showing the property. Mapping of locations such as accident scenes, property line encroachments, specific to an event, for the purpose of presenting a visual display for use in court proceedings. We use historical archives, aerials, and hundreds of mapping layers to add to thoroughly researched and surveyed disputes. Ray Carlson & Associates, Inc. uses the combined capabilities of AutoCAD® Civil 3D and ESRI® ArcGIS software to provide you with professional, accurate maps for illustration or submission requirements. For engineers, architects and land managers we can provide our maps in AutoCAD® dwg or ESRI® shapefile formats for easy integration into your workflow. We can work with art departments and graphic designers to provide raster and vector images for use with Adobe Creative Suite applications. Making important management decisions that depend on accurate information about your estate. Buying, selling, or changing the use of property, or dividing into parcels. Developing a vineyard or farm for maximum yield and/or demonstrating good land use. Prior to construction of any improvement. When considering an upgrade or purchase of GPS enabled equipment and/or field telemetry. When demonstrating due diligence and compliance to a permit agency.